Coming 2019, Somerset Zhuankou Wuhan would be the second Somerset foray into the sprawling capital of Central China’s Hubei province. This time, established in the up-and-coming Zhuankou district of Wuhan city. Thanks to its central location, Wuhan is no stranger to visitors. The city is rumoured to be one of the country's largest transportation hubs, joining major cities together with an intricate web of railway lines and buses. Divided by the Yangtze and Han rivers, much of the city’s urban structure is shaped by nature; namely picturesque lakes and expansive parks. The historical city steeped in culture sprawls across peninsulas and river deltas connected by ferries, tunnels and over a thousand bridges. The city's infrastructure is itself a sight to behold. Somerset Zhuankou Wuhan sits in the center of it all, along Dongfeng Avenue in the Wuhan Economic and Development Zone where a multitude of Fortune 500 companies have set up shop. 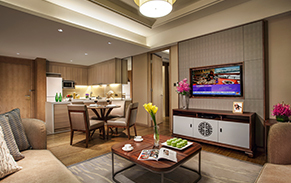 The serviced residence is built as a part of the Jianlong Zhuankou Guolinggongyuan mixed-use development, which comprises office, retail and residential components, making its location truly convenient for Somerset's global travellers. The residence is a short walk to the Wanda Plaza shopping mall, banks, convenience stores, restaurants and schools. The closest subway station, Sports Center South subway station is located within a five-minute walking distance from the serviced residence. For a well-deserved break from the concrete jungle, take a stroll by the Honshu River located along Yanhe Ave that’s a 15-minute walk away. Alternatively, make a trip to the scenic East Lake and Botanical Viewing Garden where flowers bloom all year round - orchids and cherry blossoms in spring, lotus in summer, osmanthus in autumn, and plum blossoms in winter. At the end of a long day in Wuhan, return to the Somerset Zhuankou Wuhan for a proper rest. The serviced residence offers travel-savvy guests the flexibility to customise their stay by choosing the services they require for their globe-trotting lifestyles. 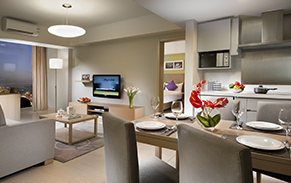 Serviced apartments range from spacious studio apartments to premium 4-bedroom apartments. All serviced apartments come fitted with a kitchenette, a washing machine and dryer and an en-suite bathroom. Residents are also encouraged to make full use of the residence's comprehensive facilities and services.